Kampot didn’t look like much on first sight; wide, dusty roads with little traffic, old French architecture with sun-bleached paint peeling off the walls, and seemingly no pedestrians. Many of the main attractions in Kampot can be taken in in one day; a patchwork bridge bombed by the Khmer Rouge (and re-built in many mismatched styles); a colossal statue honouring the durian; a massive abandoned central market like Noah’s Ark placed upside down. 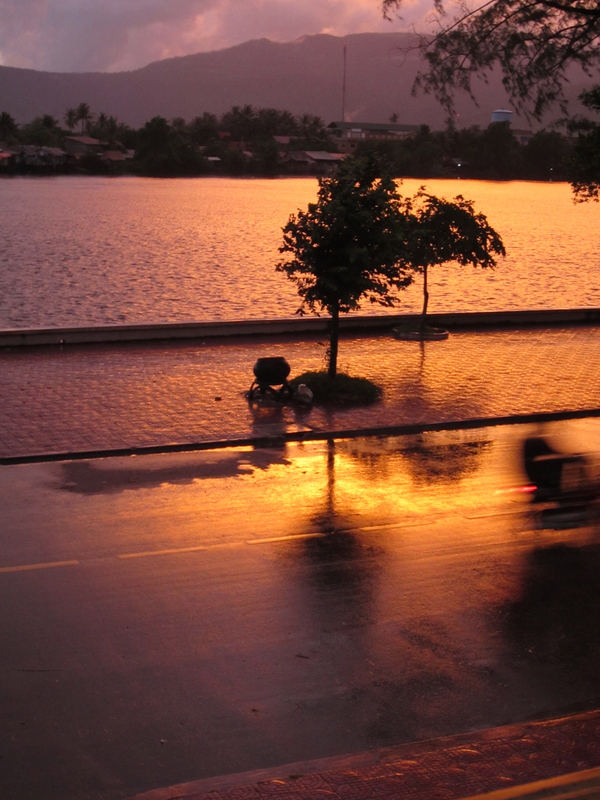 However, we soon discovered the incredible allure of Kampot’s surrounding farmland and relaxed lifestyle. Somehow, a day became a week. $6 rooms at Blissful Guesthouse. For that, we got a mosquito net and bathroom with hot water (well, what else do you need!) and a large, pub-style common room that kept us coming back with poker and trivia nights by the friendly English owner. Thatch covers outside, and staff to serve food and drinks directly to your hammock were the perfect antidote for the rainy day. 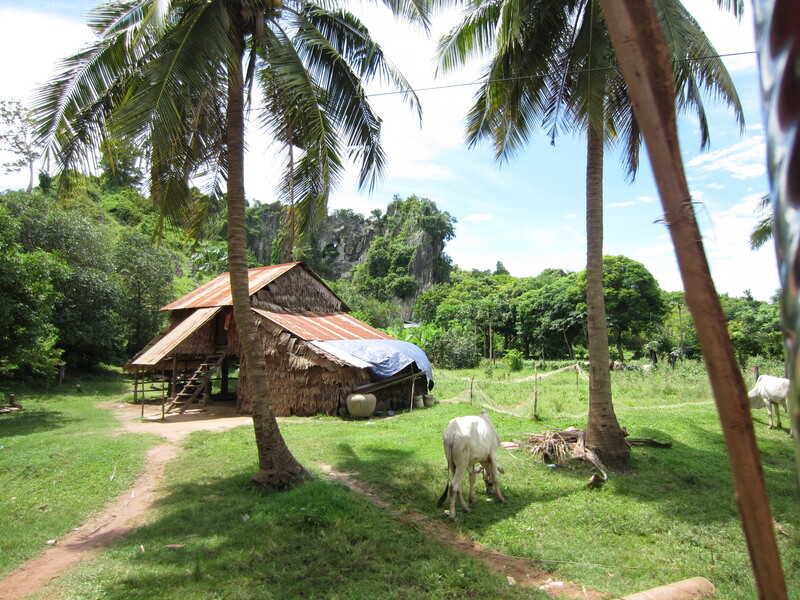 Rural, simple and unpretentious, the true gems in Kampot province can be found out in the surrounding countryside. Several times, we hired a tuk-tuk to see what Kampot province had to offer. A long, asphalt serpent slithered up the mountain. Bokor National Park, and one of the only mountains I had seen in the whole country. 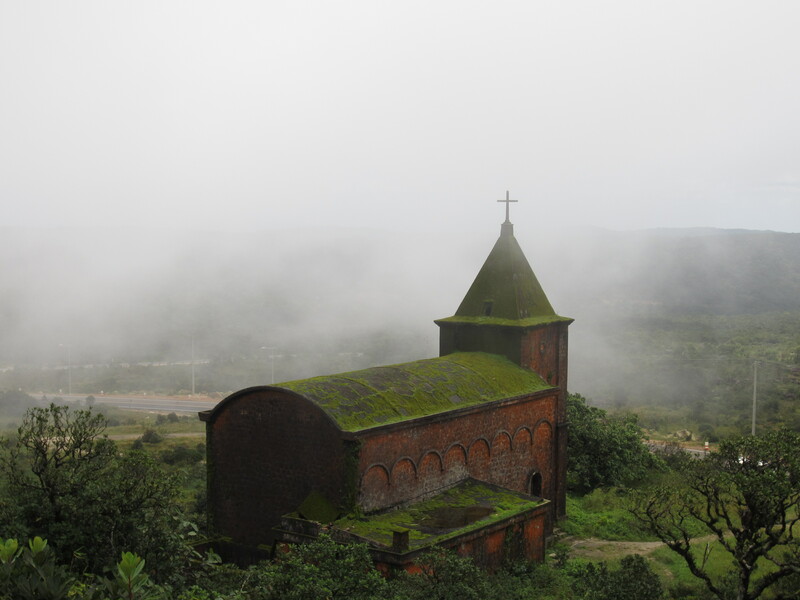 The mist was creeping across the hills faster than I could believe, swallowing an old Catholic Church whole, an embattled former Khmer Rouge hideout. Real life monsters lived here. If I believed in haunted places, this would surely qualify. Nearby was the black palace, an old holiday getaway for King Sihanouk, now decrepit. A small house at best, overgrown with thick orange moss, stenciled with graffiti and falling down. Yet despite the state of some of the historic sites, there have been major landgrabs here, most notably construction of a shiny new casino (which seems very out of place) just opened. Out in the pepper farms, the pepper vines wrapped up and around tall red brick stacks, forming shaggy pillars of rich green leaves. We were visiting Starling farm; traditional and organic. One of the employees invited us to taste the pepper from the vine. Like a glass of champagne from Champagne, Kampot pepper is world-class in taste, region-specific, and the locals are very proud of their crop. It comes in white, black and red, and even a solo peppercorn tastes great. We made a day trip out of the little seaside town of Kep. It takes about an hour or so by motorbike through some pretty interesting roads, badly degraded by rain and the wheels of trucks (welcome to muddy potholes big enough to swallow a motorbike). On a rock pathway reaching out to the sea, a white mermaid statue watched dramatic grey clouds tumble across each other, and waves gently lap up against the beachfront. The beach at Kep was small and rocky and the weather was growing cold, so we sat down and ate seafood fried rice instead. Satisfied with our time at Kep, we rode back. 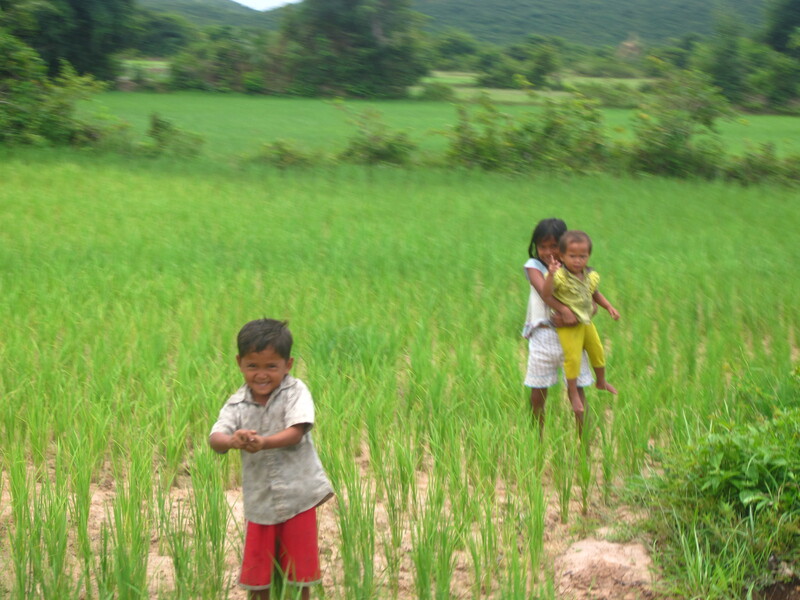 Visiting the rice fields around Kampot is a fantastic, humbling experience. Stilted wooden houses and the rice planting season, pride, joy, family. Down the road came a rusty old motorcycle and trailor picking up coconuts. Emaciated white cows wandered along, whipped by old, resolute farmers, callused hands, hard work. It makes you feel happy; there was a sense of simplicity and respect here. Dirt roads of rich red soil connected farms and main roads, raised above field level and tapering down to form runoff channels. As we rode along on a rented Honda Wave, the sunlight caught the water and the endless fields of lime green rice stalks glowed. It glinted across the surface of the vast fields of water through which all rice grows, and for a perfect few moments, the sun floated on top of the rice. We passed a group of children gathered around a pool of water in the field, and as we waved, they waved back and jumped into the pool, landing with a splash. Kampot is awesome! Giving some chuppachups to the kids was really fun hahaha!